Ask most Americans about the Royal Canadian Mounted Police (RCMP) — more commonly called the Canadian Mounties — and you’ll frequently hear comments indicating a generally high regard for the Mounties and their association with the frontier derring do. With their iconic red serge coats and dimpled Stetson hats, the public image of the Mounties has had a warm reception in the American imagination, even if over the years, like many police forces, they have had their ups and downs and share of controversies. My early introduction to the Mounties included watching as a kid countless Dudley Do Right cartoons, which presented an amiable if bumbling caricature of a Mountie, and educational reels from school about the valor of the Mounties. Slightly later came Monty Python’s humorous send up of another Canadian icon, the lumberjack, which featured the good-natured Mounties providing a back up chorus. Probably because of all these sources I almost always thought of the Mounties as a wilderness fighting force, and did not fully understand their broader policing role. The idea that the Mounties “always got their man” also stuck with me from childhood. Fittingly, that unofficial motto was attributed to the Mounties by an American publication (at least according to the Wikipedia entry on the RCMP). The RCMP as we know it today resulted from the merger of the Royal Northwest Mounted Police, which first patrolled the Northwest Territories starting in the late 1800s, and the country’s Dominion Police. 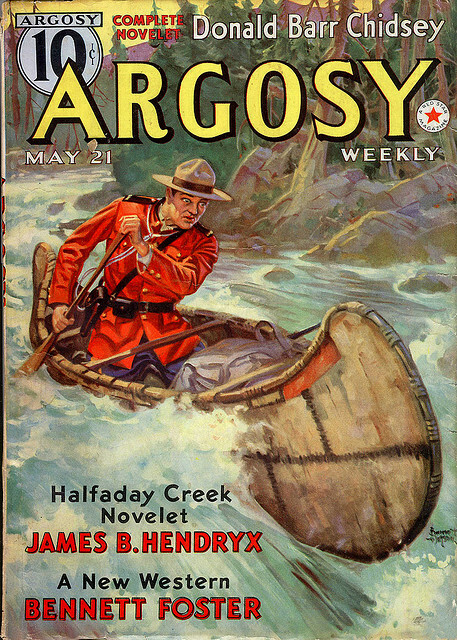 As testament to the acclaim enjoyed by the Mounties, they were frequent heroic subjects of popular American books, pulp fiction, magazine stories, radio shows and movies from the 1920s through the 1960s. A sampling of related pop culture images is collected below.